This is going to be so much fun. This year I get to participate as a vendor in The Look of Local Fashion Show, an event put on by Cambridge Local First in conjunction with The Garment District and Boston Costume and a bunch of the most happening local businesses around. It is going to be fantastic. The party starts at 6pm at The Garment District at 200 Broadway in Cambridge. There will be a fashion show, raffle, free food and drink, and a chance to buy from local vendors who are showing their items in the show. I’ll be one of them and I am SO excited. 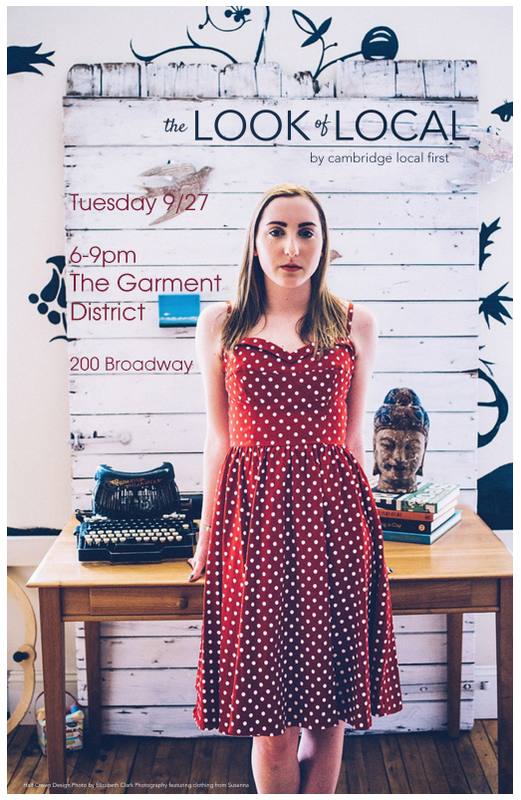 On Tuesday, September 27th from 6 to 9 p.m., join The Garment District and Cambridge Local First for an evening of food, fun, and fashion at the second annual Look of Local event. There will be a fashion show with clothing, shoes, and accessories from local retailers, vendor fair, a DJ, and complimentary food and drink. Entry is free, and we’re thrilled to host this year’s event here at The Garment District, 200 Broadway, Cambridge. The show is FREE but registration is a really good idea. Click here to register.